Factory orders rose last month for a change, but nearly all of it was due to transportation, especially aircraft orders that have a very long lead time. This month we see a 0.2% decline that's in line with the Econoday Consensus Estimate. Flat is a good description of the nation's factory sector as factory orders slipped 0.2 percent in November, making October's revised 1.3 percent gain look like a rare outlier. Durable goods orders were unchanged in the month while orders for non-durable goods fell 0.4 percent on price weakness for petroleum and coal. 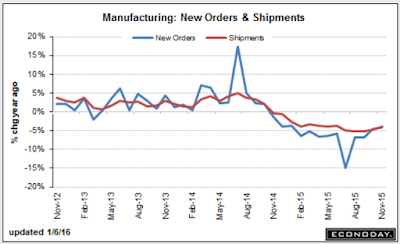 Capital goods data, unfortunately, are mostly weak including a 0.3 percent decline for core orders. Shipments of core capital goods fell 0.6 percent in November and follow October's 1.0 percent decline in readings that will pull down the business investment component of the fourth-quarter GDP report. Outside of orders, total shipments edged 0.2 percent higher to end a string of declines that go all the way back to July. Inventories also offer good news, falling 0.3 percent and bringing down the inventory-to-shipment ratio to a less heavy 1.35 vs October's 1.36. 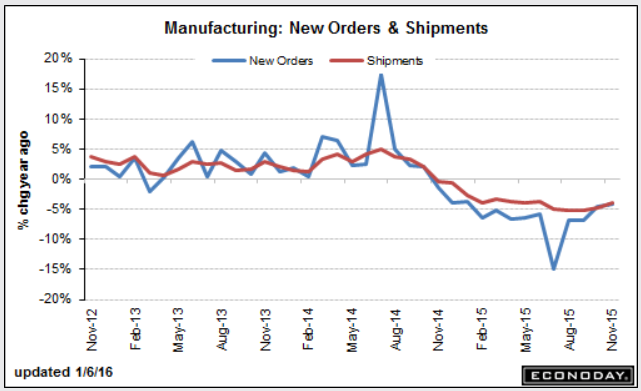 Unfilled orders are another positive, rising 0.2 percent following a 0.3 percent gain in October. The factory sector is not exactly robust, the result of weak demand for U.S. exports and also weakness in the domestic energy sector reflected in this report by a 13.6 percent monthly plunge in orders for mining & oil field machinery. But the nation's economy is not narrowly focused on the factory sector, evidenced by healthy readings in today's ISM non-manufacturing report. Bloomberg commented "But the nation's economy is not narrowly focused on the factory sector, evidenced by healthy readings in today's ISM non-manufacturing report." Well, the nation's economy is certainly not centered on consumer spending as most think. If it was, one could spend themselves to Nirvana. Moreover, manufacturing's importance is misunderstood nearly across the board. I posted a chart showing the relationship of manufacturing to nonfarm payrolls. The above chart plots percent change in seasonally-adjusted nonfarm payrolls vs. the seasonally adjusted ISM manufacturing index. 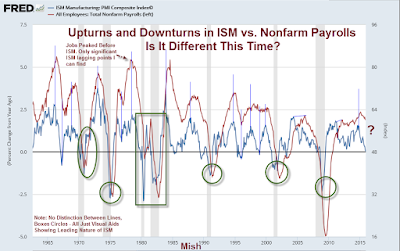 Looking at about 30 turning points since 1965, I can only find one key top or bottom where manufacturing ISM did not lead jobs. 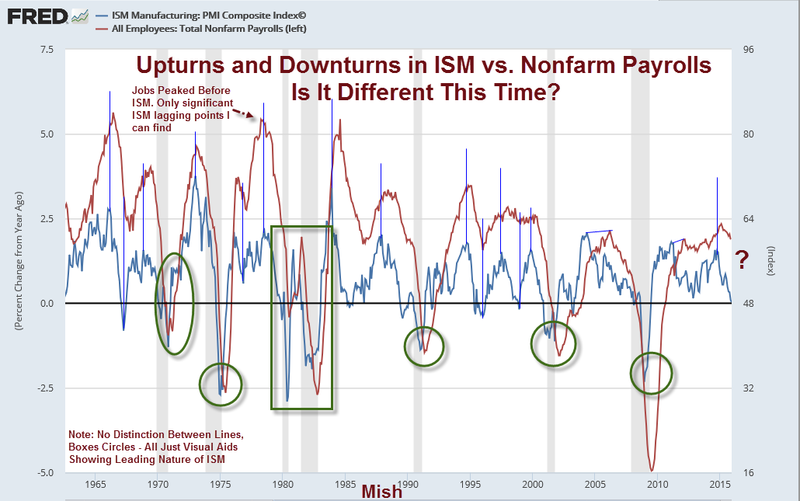 For more details, please see ISM a Leading Indicator of Jobs? Why 2016 Will Shock to the Downside!